Along a portion of East Vermont Street in the historic Lockerbie district of downtown Indianapolis, a 120-year-old red brick wall embraces modern-day condominiums. Patti Horrigan, age 89 “and three-quarters,” reminisced as she gazed at the wall on the morning of May 20. Her reflection took her back to 1936, when her father had arranged for her Girl Scout troop to tour the building that then existed behind the wall. That building was the Home for the Aged, where the Little Sisters of the Poor cared for impoverished men and women ages 60 and older regardless of race, religion or ethnicity. By the time Horrigan visited the home in 1936, it was already 63 years old, having been opened in 1873. Horrigan was joined by about 125 others who came on May 20 to witness two historic events: the unveiling of a state historical marker at 520	E. Vermont St. where the home for the elderly poor existed from 1873-1967, and the declaration of May 20 as “Little Sisters of the Poor Day” by Indianapolis Mayor Joseph Hogsett. The sisters and residents moved to a new facility in 1967 on the northwest side of Indianapolis, where it now operates as the St. Augustine Home for the Aged. The marker acknowledges the 144 years the Little Sisters of the Poor have served the needy elderly in the state of Indiana, with a nod to the order’s national and global service as well. The story begins in 1839, when St. Jeanne Jugan founded the order in France. Sisters or the order first arrived in the United States in New York in 1868. Just four years later, Bishop Jacques M. Maurice de Saint-Palais of the Vincennes Diocese invited several sisters to care for the elderly poor of Indianapolis. They arrived in early 1873, and within months the home on East Vermont Street was up and running. 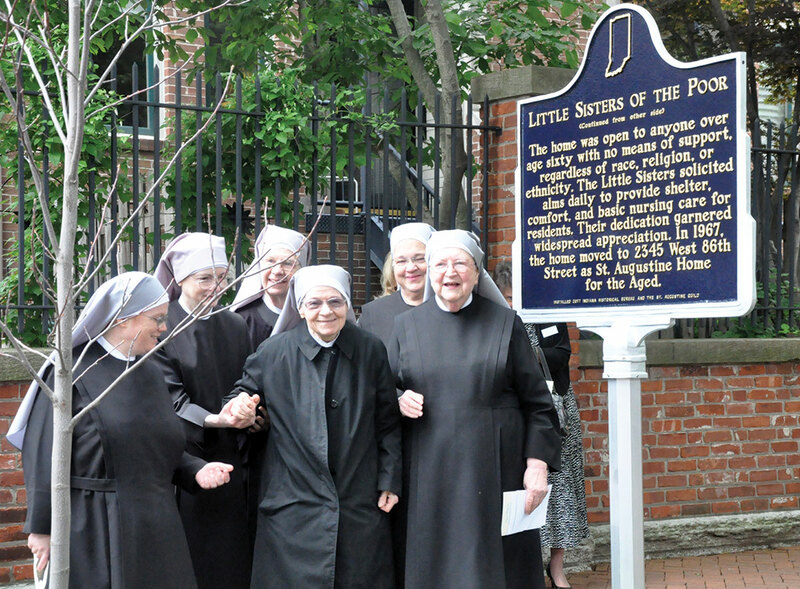 In recalling the impact the Little Sisters had in the state since that time, Indiana Historical Bureau (IHB) historical marker program manager Casey Pfeifer read a newspaper excerpt to the crowd during the May 20 event. “When [the sisters] first arrived in New York, the Brooklyn Daily Eagle published an article: ‘Everywhere, their quiet, unostentatious charity, their humble but earnest work and helplessness of the class to whom their lives are devoted have won for them the sympathy and love not only of the members of their own faith, but of all others in which Christian charity and love are component parts,’ ” Pfeifer read. That care was not isolated to Indianapolis. “Even though it may seem we’re celebrating the Little Sisters of the Poor in Indianapolis, this is a state marker because of their efforts outside Indianapolis as well,” said Elizabeth Hansen, St. Augustine Guild historian. “The Little Sisters opened the St. John’s Home for the Aged Poor in Evansville in 1882, and cared for over 5,000 residents there before it closed in 2013. No matter where they serve, the order is known for their tradition of begging to help care for their residents. Just as their founder went from door to door seeking food and donations to care for the elderly, so do the sisters turn to their local community and its businesses to assist them in their mission. “The Little Sisters walked around downtown with their tambourines, and they would shake the tambourines saying, ‘Alms for the poor! Alms for the Poor!’ ” recalled Horrigan. Her father owned Donnelly’s Tavern not far from the original Home for the Aged. She remembers her father inviting the sisters into the tavern to beg from his clients. “He told his customers, ‘If you have a penny or a nickel, give it to the Little Sisters, and everything you want to eat or drink is on the house,’ ” Horrigan said. In more recent times, the Little Sisters begged from Jug’s Catering, owned by the late Charles “Jug” Eckert. His wife Bea Eckert Deitchman, 83 and a St. Augustine Guild member for 31 years, donated the money for the historical marker, dedicating it in memory of Jug and their son, Sam. By 1962, the aging home was no longer able to meet the modern needs of its residents, the sisters and the staff, even after several expansions through the years. Fundraising efforts began. Land was purchased on the corner of West 86th Street and Township Line Road in the northwest quadrant of Indianapolis, and a new home—named the St. Augustine Home for the Aged—was built. With the physical and financial help of 18,000 businesses, groups and individuals, the sisters and the residents moved there in November 1967. That was the same year the St. Augustine Guild was founded to assist the sisters in their mission. Linda Bear, chair for the guild’s 50th anniversary celebration, spoke fondly of the Little Sisters, the home and the residents. That family now includes nine sisters—seven ministering and two retired—96 residents and more than 200 guild members. It was Bear’s idea to pursue placing an historical marker as a way of celebrating the guild’s 50th anniversary. Guild historian Hansen spent hours online and in the Indiana State Library reading newspapers and searching through microfilm for the documentation required to apply for an IHB marker. Of the nearly 30 applications the IHB received in 2016, 18 were approved, said Pfeifer. Mother Mary Vincent, outgoing administrator of St. Augustine Home for the Aged, said she “can’t imagine all the work that went into accomplishing” the granting of the marker. To her it was another sign of the guild members’ dedication to their cause. Bear had one more idea to mark the guild’s 50th anniversary: to have the mayor declare a day to honor the Little Sisters of the Poor. St. Augustine Home’s development office, contacted the mayor’s office. 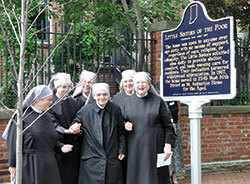 Mayor Joseph Hogsett’s proclamation of May 20 as “Little Sisters of the Poor Day” was proudly displayed on the morning of the unveiling of the historical marker. Other accolades were announced during the unveiling ceremony as well. Letters of praise and congratulations from United States senators Joseph Donnelly and Todd Young were read, and Indiana Sen. Jean Breaux presented the sisters with an Indiana Senate Certificate of Achievement. One last accolade was read—a letter from Cardinal Joseph W. Tobin, archbishop of Newark, N.J., who led the Archdiocese of Indianapolis from 2012-16. “I applaud each of you for your constant and fervent presence as the face of Christ the Redeemer to those most in need of physical and spiritual healing and comfort,” he said in the letter, read aloud by St. Augustine Home director of development Nathan Buonanno during the ceremony. Mother Mary Vincent, who left at the end of May for a new assignment in Pittsburgh after six years as administrator of the Indianapolis home, was overwhelmed on the morning of the marker’s unveiling. She paused to choke back tears as she looked at the crowd.